If you've already bought a 4K UHD, we have some bad news for you: it is incompatible with the best 4K UHD content just trickling out from Netflix and Vudu, from pending 4K UHD Blu-ray decks and discs, due later this year, and from eventual 4K broadcasts, likely first available from satellite providers sometime next year. Among the first future-compatible 4K UHDs will be two new Vizio's two Reference Series models, the 65-inch RS65-B2 ($5,999.99) and the 120-inch (yes, really, 120 inches) RS120-B3 ($129,999.99), which went on pre-sale today. 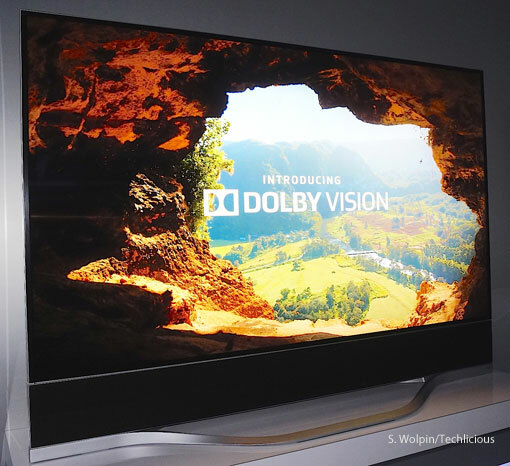 These are the first TVs of any type imbued with Dolby Vision HDR, or High Dynamic Range (HDR) technology. HDR boosts the contrast and color on 4K UHD TVs to hitherto unreachable levels. HDR-enhanced video looks almost three-dimensional – brightly-colored objects seem to protrude from the screen, making scenes seem almost topographic – without any glasses. With HDR, you will literally be able to see things you never saw before such as details previously buried in deep shadows or heretofore hidden in the flash of explosions or glare from a bright lighting, the sun or reflected off a mirrored surface. If you own a newish smartphone, you may already be familiar with HDR. In your camera app, you should be able to turn on HDR to see the before-after difference it makes in photos you've already shot. All new UHDs going forward, at least at the top tier of each manufacturer's line, will now include HDR, thanks to standardized HDR specifications recently released by the Consumer Electronics Association (CEA). These new HDR-enabled UHDs also will include updated HDMI 2.0a jacks; current and older UHDs just have HDMI 2.0 jacks, incapable of displaying these new HDR enhancements. For instance, what may arguably be the best TVs extant, the new LG 55-inch 55EF9500 ($2,999) and 65-inch 65EF9500 OLED UHDs ($4,999.95), also are equipped with HDR and HDMI 2.0a jacks, and a month ago Samsung announced its new 4K UHD TVs would be updated to HDMI 2.0a. The problem is, there other kinds of HDR, and the Vizio doesn't play well with these others. Yes, Vizio's Reference Series models have HDR, and Dolby Vision is arguably the best of a new generation of HDR schemes. Each UHD maker is free to add their own flavors to the baseline CEA HDR specifications (which, by the way, came from Dolby). But Dolby Vision HDR, for reasons too technically unnecessary to explain, does not require HDMI 2.0a. So, the new Vizio sets are equipped "only" with HDMI 2.0. Since these new sets have only HDMI 2.0 jacks, they can display only HDR content encoded in Dolby Vision. At the moment, that Dolby Vision content consists only of Warner Bros. films streamable from Vudu that include The Great Gatsby, Into the Storm, The Lego Movie, Jupiter Ascending, Mad Max: Fury Road, Magic Mike XXL, Man of Steel and San Andreas, along with and the first season of Netflix's original series, "Marco Polo." On the HDR horizon is the second season of "Marco Polo" and 4K UHD Blu-ray titles from Warner Brothers and, a little later, Sony. The first 4K Blu-ray decks and discs should be arriving later this year and in greater volume next year. The problem is that because they lack other HDR-compatible HDMI 2.0a jacks, these new Vizios won't be able to display any non-Dolby Vision HDR-encoded enhancements, disc or broadcast content, just the standard 4K picture. The new Vizio's are smart TVs, connectable to the Internet via an Ethernet jack or 802.11ac Wi-Fi. As such, the sets can be upgraded to be compatible with HDMI 2.0a. But Vizio isn't making any commitment to if or when this upgrade might happen. "We will not leave consumers high and dry," a Vizio executive told me when I asked him if an upgrade to HDMI 2.0a would be forthcoming. "We will always be in a position to support our customers." So, no promises were made, but it's hard to imagine Vizio wouldn't supply an upgrade at some point. The two Vizio Dolby Vision Reference Series UHDs are both flat (as are the aforementioned LG 4K OLEDs; curved TVs not only do NOT enhance the viewing experience, in my and many other experts points-of-view, but actual detract from it with greater reflection and limited viewing angles – but I digress). Vizio's sets also offer full-array backlighting – the backlight backs the entire rear of the LCD panel – with a whopping 384 zones; this means secific sections of the screen can be lit, or not, at whatever levels demanded by the scene. Other LED LCD UHDs are edge-lit – backlighting is directed in from the sides of the frame, a far less precise method of lighting the screen than full-array. To make colors pop even more, the 240 Hz Vizios also are equipped with quantum dot Wide Color Gamut (WCG) technology (see our earlier "Beyond LCD: Which New 4K UHD TV Technology Is Best?" for a deeper explanation of these technologies). You can't buy these Vizio Reference Series sets from regular retailers – yet. Initially, you have to buy the set through a local custom installer, and the price includes free delivery and set-up; calibration will cost extra. Exactly when the sets will be actually available has yet to be announced. Did the author look at the SEK3500 Evolution Kit for Samsung? Samsung recently introduced the SEK3500 Evolution Kit for some of their 2013 and 2014 models to bring them up to date. I bought one and paid €360. Was that information considered for this article? 240 hz over a hdmi2.0a ???? I’m questioning when you have any comments at the longevity/best of Vizio elements. We purchased a Vizio television primarily based off of a Wirecutter recommendation, and 18 months after buy we have a “panel trouble” ensuing in a vertical blue line going for walks from top to back side. Our television is now junk - too steeply-priced to repair consistent with Vizio. When you do a look for Vizio online, a lot of these comparable troubles come up - tvs breaking down very rapidly after the 1-year guarantee expires, Vizio announcing that repair is simply too pricey. So we have to buy a brand the new television. A worker at a local electronics shop said that he advises people never to buy for Vizios because they spoil down too regularly. We will NEVER buy a Vizio again and rather will choose a Samsung or Sony. These are disposable and Vizio does not seem to care at all.